While I would never consider myself a “master chef” or even a “really amazing cook”, I do enjoy being in the kitchen and trying new recipes and ideas. I also like finding simple solutions to improve the taste of my food and reduce the amount of time I spend in the kitchen. And since Thanksgiving is only a couple weeks away, I thought I’d share one of the super simple (yet slightly unconventional) things I often do to help my turkey meat come out nice and juicy every time. 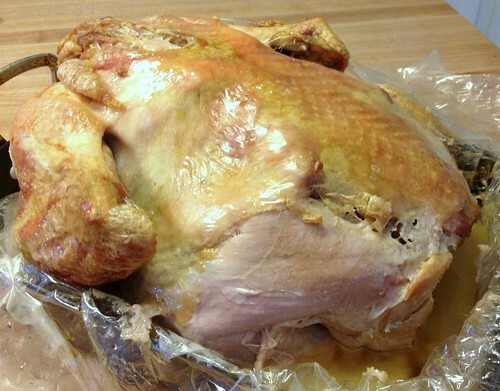 For starters, I always roast my turkeys in an Oven Bag — in fact, I can’t even remember the last time I roasted a turkey (or a chicken) without a roasting bag. The bags are very inexpensive, they are available at most grocery stores (or online), they save your oven from boatloads of grease splatters, and they almost assure your meat will turn out extremely moist and juicy. As you probably guessed by the title of my post, another slightly unconventional tip I use is to roast my turkeys breast DOWN. As you can see by the 2 photos below, roasting the turkey with the breast down is not nearly as pretty as when it is roasted breast up… but since I almost always carve the meat off the bones before I bring it to the table, it really doesn’t matter much what the bird looks like coming out of the oven. I’m positive Martha Stewart would not approve — but my dinner guests have never once complained! Although I’ve roasted many turkeys these past 9 years, Dave and I are actually hosting our first Thanksgiving party this year… and you can bet I’ll be using this tip to assure our turkey meat is fall-off-the-bone delicious! Have you ever roasted a turkey breast down? Filed under: Food • Holiday Foods • Tips and Tools • Misc. I always use oven bags! I love them for Turkey, chicken and even pot roast. I host Thanksgiving and I have never had a dry turkey. 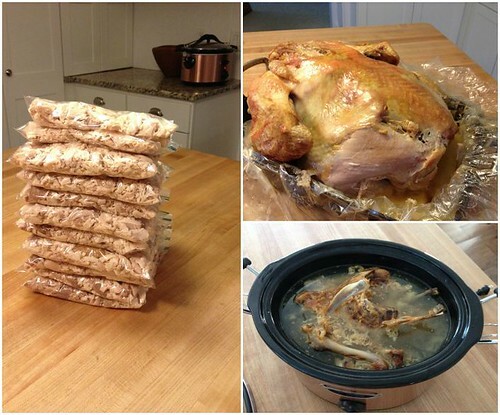 You encouraged me to thaw my turkey (on super sale from last year) and cook it up this weekend! What temperature do you cook it at? I’m cooking it breast side down too for the first time! I will report back on its deliciousness! Yay for turkey! The cooking time depends on the weight of the turkey and if you are going to stuff it or not (I never stuff mine) so just follow the instructions on the cooking bag (or on the turkey) and you should be all set! The turkey I made last weekend breast side down and in a bag was AMAZING!! It was the most moist white meat! It does cook faster in the bag as well. Just follow the instructions in the box and good to go! My 16lb turkey took 3 hours. Yummm! I also softened 1.5 sticks of butter and mixed into the butter some dried oregano, basil and sage. About 1 TBSP of each and rubbed the top and bottom of it while in the bag! Thanks for making our turkeys tastier, Andrea! Hi Andrea. I have a question regarding your turkey-cooked-in-a-bag. 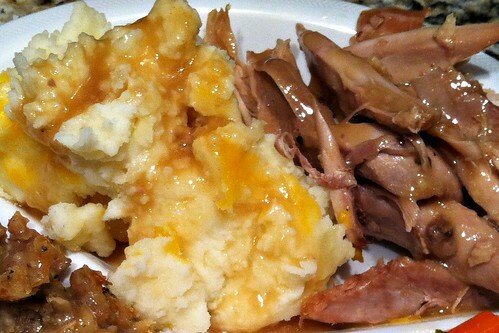 Are you able to save the drippings to make the gravy from the bag? Yup, you will need to cut open the bag to get the turkey out, so all the juices just run into the pan and are ready to go to make gravy. Yes! I don’t make a lot of turkeys but I make whole chickens all throughout the year and always roast breast side down! Much better white meat this way — I totally agree! (Usually do mine in the crock pot). Does cooking the turkey in the bag change the cooking time at all? Does it cook faster or slower? Are there any other changes to the normal cooking process by cooking it in the bag? 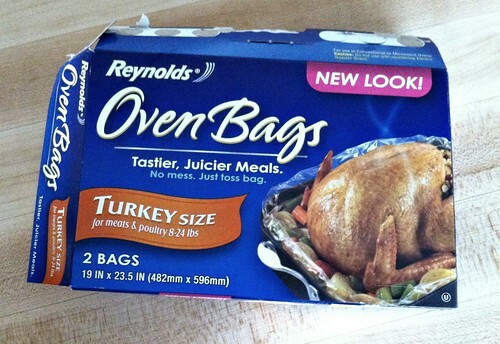 I’m not sure, I’ve only ever used a bag so I don’t have experience roasting a turkey without one. However, the bag comes with instructions so just follow those and you should be all set! Normally, I don’t used a cooking bag, but I do roast my turkey “Breast Down”. If it is a smaller turkey (12-14lbs), I turn it over to “Breast Up” about halfway through the cooking process and it browns the skin nicely for presentation or some crunchy “Skin Snacking”. I do the same thing, both with turkeys and with whole chickens. Works wonderfully! My grandparents always made turkeys this way, too! Delicious! I’ve been doing this for years. In fact lately, over the last five years, I cook my turkey breast side down in the slow cooker/crock pot. 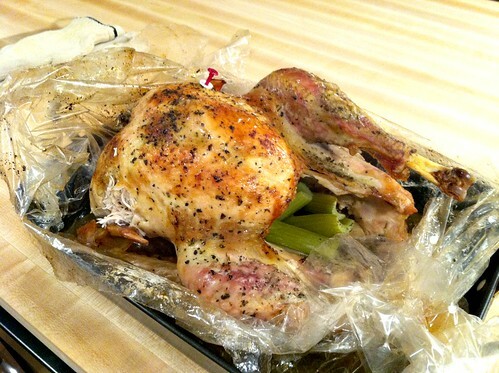 The oven bags as well as the slow cooker bags keep mess to a minimum and help keep the bird juicy.